I finished Uncle Jon’s minion hat earlier today. Uncle Jon modeling his minion hat. I used Hobby Lobby I Love This Yarn in “Yellow” and Vanna’s Choice in “Black,” “White,” and “Charcoal Gray.” I magic looped the whole hat on size 4 and 6 needles. The eyes are crocheted (don’t remember what size hook I used), and the goggles were knit with size 7 dpns. My only complaint about the project is that the decreases do not result in a smooth crown. Other than that, it was pretty easy. I even learned a new technique: I-cord! 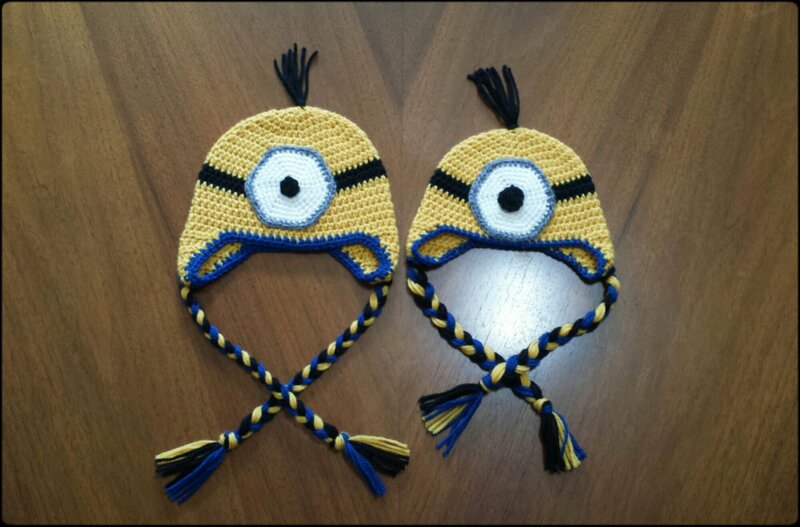 Categories: Knit | Tags: acrylic, despicable me, hat, knit, minion | Permalink. I started Uncle Jon’s minion hat today. It seems like a pretty straightforward project. I’m a little nervous about the goggles, but they can’t be that hard to make, right? If this hat turns out cute, I’ll make a smaller one for Eva so they can match. I hope this doesn’t end up looking like a bumble bee. Categories: Knit | Tags: despicable me, hat, knit, minion | Permalink.